Last weekend, I was fortunate enough to spend a weekend in Paris . A weekend with 65 other Mozillians(20 volunteers, 45 staff) nominated by their regional and functional areas to lay the groundwork that is necessary for the successful execution of the Summit in October. The power of ‘open’ is the only reason I can justify the air I was breathing among so many incredible people: leaders. Finding my voice among so many brilliant, groundbreaking, inspiring people was sometimes overwhelming, but empowering. Mozilla is good at making everyone matter. 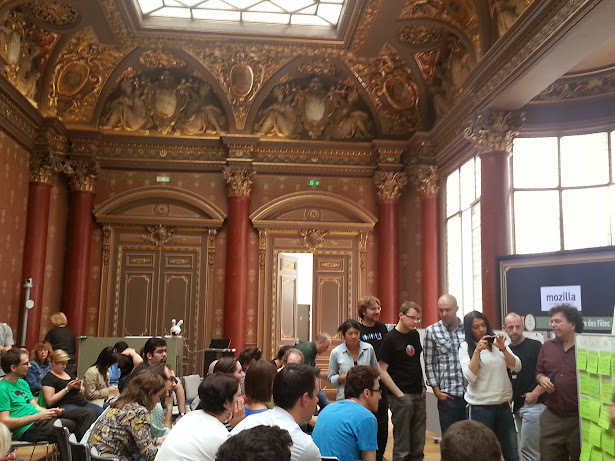 We came together at Mozilla’s newly opened Paris office, easily the most beautiful office, I’ve ever been to … ever. ‘Unconference-style’, we spent the weekend getting to know each other, sharing our thoughts, frustrations, goals and in the end finding ourselves a united and dedicated core to the future of Mozilla’s Summit. Discussing the future of Mozilla, of course means discussing the present-Mozilla, and it was with some interest that the weekend started off with discussions around employee / volunteer relationships, old vrs new Mozillians , what it means to be Mozillian, who is ‘the community’ anyway ? How can we focus on Mozilla’s mission as we grow? Why does growth matter? Why does community matter? More questions, I had never considered: how does it feel to come to Mozilla as a new hire, or a long-time empl0yee adjusting to new focus, new volunteers. I also admit the initial focus on relationships concerned me a bit. Yes, it all seemed a bit challenging at first – and then it wasn’t. Entire days of conversation continued on into dinner, and then into the night, on the train back to our hotel and again at breakfast. This focus is why I know the Mozilla Summit will only only be a huge success, but that Mozilla is in excellent hands for the future. Over two days, those initial concerns melted away – we got to know each other, we were Mozillians – and at the core we all believe in the power, and importance of Open, this is our connection. Lukas Blakk provided a great visual of ‘open’ being our core, with layers built on top of that core further identifying our individual purpose and interests. No matter how many layers-out we identify, our core is ‘Open’ and this brings us together. I liked this visiual a lot. And then yes, of course! We got to all of those fun and important things we really wanted to focus on – innovation, the future of the web, mentoring, diversity, process, connecting all three event locations – to name only a few. From these, we identified themes and created groups dedicated to building the momentum of these themes for Summit. I am pretty excited to be in the same working-group as Mitchell Baker focusing on Mozilla’s Purpose. Other groups: Strategy, Product, Process and People. The Mozilla Summit will be held in three different locations this year, to better accommodate our size, locations are: Brussels, Toronto and Santa Clara (I will be a host Brussels Toronto). Our small group accomplished a lot, and I can’t wait to see what happens next. As Mitchell said in opening circle: ‘I am all in’ , and hope you are too :) See you in October!